Here we go again, another round up of the passing year. Despite of King of Pop stayed alive forever only in music then this year wasn't so boring. Characteristic point of the year 2012 is precisely connected with 25th Anniversary of “Bad” album and its exclusive edition given us by Sony. We had been given 5 demos of the songs from Bad session which as for irony they sounds like finished songs and the title of them are: "Al Capone", "Free", "Don't Be Messin' Round", "Price of Fame" and "Song Groove (aka Abortion Papers)" as also to this pack booklet with pictures from "Bad" session together with concert at Wembley Stadium in London taken from Michael's private VHS re-mastered and digitally recorded. And finally Spike's Lee "Bad 25" documentary which presents us behind the scens of creating "Bad" album and to enjoy the film you need 2 hours (German "VOX" TV didn't broadcasted full movie). Less uproarious but in memory we have also 30thy anniversary of "Thriller" album. Luckily Sony have a mercy for us and didn't issue for us another "new stuff". In the next year we will be given more no one new stuff from Michael's legacy and that's why you should stay tuned. We are always up to date. Today it's 30 years after music industry has been revolution. After little success of album "Off The Wall" Michael had decied to do much better album which will get to #1. The first finished project of the "Thriller" album got into a trash, Michael felt down about the result he got, but he didn't give up, he started creating new one. The effect of finished and released the second album became spectacular. The album in first two months got Gold and Platinum certificate and the same time. During Grammy Awards Michael broke new record, winning 8 awards for a one artist, for Thriller. During night of Motown 25th TV Special Jackson performed his single Billie Jean and electrify audience performing Moonwalk. The album became the album of all-times and gots to gusto of every ethic group, after that used to music TV MTV broadcast Billie Jean after being warned by CBS Records, it was the first music video of black artist which broke all barriers of racism and revolution MTV bringing them big popularity. Michael gone further and created the first long time duration music video about 13 minutes long of fantastic plot, special effect and amazing dance choreography Michael made another record. There are 3 Michael's own songs on the album; Beat It, Billie Jean and Wanna be Startin' Somethin'. Album kept his #1 position on chart in US by 37 weeks, in UK kept 8 weeks of being #1. Today Thriller is sold in more than 114 millions of copies worldwide. On November 15, 2006 Michael gots Diamond Award for selling more than 104 millions of copies of Thriller. Bad 25th is great selling album in Poland. This legendary album and its 3rd issue on 25th anniversary can show us that King of Pop music is lifetime music. Almost a moth later after Bad 25th is released the Gold plate status is reached in Poland. MJ Estate is also reporting that only officially released Bad Tour Live at Wembley is No. 1 selling in the world. The scene in Michael Jackson's London hotel suite left Randy Phillips in a panic. Phillips was one of the world's most powerful music promoters and used to rock 'n' roll chaos, but the star's condition still floored him. "MJ is locked in his room drunk and despondent," Phillips said in an email to his boss at Anschutz Entertainment Group, the Los Angeles company staking a fortune on the singer. "I [am] trying to sober him up." Across the Atlantic, where it was still early morning, AEG President Tim Leiweke read the message and fired back on his BlackBerry: "Are you kidding me?" "I screamed at him so loud the walls are shaking," Phillips told him. "He is an emotionally paralyzed mess riddled with self loathing and doubt now that it is show time." The story of Jackson's ill-fated comeback attempt has been told in news reports, a manslaughter trial and a feature-length documentary. But a cache of confidential AEG emails obtained by The Times offers a darker picture of the relationship between the down-on-his-luck idol and the buttoned-up corporation taking a bet on his erratic talents. The 250 pages of messages illuminate the extent to which top executives were aware of doubts about Jackson's stability as they prepared for his 50-show concert run at their London arena. The emails will probably play a central role in two lawsuits set for trial next year. The shows' insurers are asking a judge to nullify a $17.5-million policy that they say AEG got with false claims about Jackson's health and readiness to perform. Jackson's heirs are pressing a wrongful-death suit that accuses AEG of pressuring the pop star to carry on with a comeback despite indications he was too weak. "If you are in the creative arts business, you are going to be involved with individuals who have a great many problems," said AEG attorney Marvin Putnam. "Michael Jackson was an adult and … it is supercilious to say he was unable to take care of his own affairs." Michael Jackson was a megastar but also had a trail of burned investors and canceled performances that loomed large when AEG began contemplating a deal with him in the fall of 2008. Even before meeting with Jackson, executives at the highest levels of AEG, including billionaire founder Phil Anschutz, were seeking insurance to protect the company's bottom line if the shows didn't come off, according to the emails. Anschutz invited Jackson to a meeting at a Las Vegas villa in September 2008. Paul Gongaware, an AEG Live executive who knew Jackson, emailed colleagues a strategy memo. Wear casual clothes, he told them, "as MJ is distrustful of people in suits" and expect to talk "fluff" with "Mikey." The company was proposing a world tour that would net the cash-strapped star $132 million, according to the memo. "This is not a number that MJ will want to hear. He thinks he is so much bigger than that," Gongaware warned. Talk in terms of gross receipts, he suggested. The singer and AEG signed a deal in January 2009. According to the contract, AEG agreed to bankroll a series of London concerts at its 02 Arena and Jackson promised "a first-class performance." If he reneged, AEG would take control of the debt-ridden singer's company and use the income from his music catalogs to recoup its money. There were doubters inside and outside the company. Dan Beckerman, AEG's chief operating officer, sent Phillips, the chief executive of concert division AEG Live, a YouTube link to Jackson's shaky 2001 MTV appearance and asked, "Can he pull this off?" "With time and rehearsal," Phillips wrote back. Pressed by another promoter about Jackson's ability to deliver, Phillips shot back in an email, "He has to or financial disaster awaits." "MJ is not in shape enough yet to sing this stuff live and dance at the same time," the show's musical director informed supervisors in an email. Jackson missed another week of rehearsals, and when he finally showed up June 19, he was too weak to perform. "He was a basket case," a production manager wrote. "Doubt is pervasive." "Michael's death is a terrible tragedy, but life must go on. AEG will make a fortune from merch sales, ticket retention, the touring exhibition and the film/dvd," Phillips wrote to a concert business colleague in August, adding, "I still wish he was here!" Date: August 29, 2012 Happy Birthday Michael! Time is passing, Sony is releasing new stuffs for us... Sometimes there are even music pearls. If he would be alive on stage today there would be passing 41st anniversary of his career but in the mean time there is going to be released 25th anniversary of BAD album which will be available in stores on September 18. Today is big day and sad day at the same time. Michael you gone 3 years ago but as long as memory lives you are immortal. Happy Birthday 54th time! Date: August 7, 2012 Bad 25th Anniversary Edition. Complete Tracklist. CD one features re-mastered versions of Michael’s biggest hits on the original BAD album, including, “Smooth Criminal,” ”Man In The Mirror,” “Bad,” “Another Part of Me,” “The Way You Make Me Feel,” and “Dirty Diana” arranged in the same sequence as they appeared on the original album released 25 years ago. “Leave Me Alone” was added to the album as a bonus track following its initial release and has been included on the disc. Date: June 25, 2012 3rd Anniversary. Today is 3rd anniversary since Michael gone. But as long as we are Michael will live as well. We remember him and because of this occasion we would like to invite you all MJ fans and not only for the party in tribute for King of Pop which take place on June 30 in Warsaw's Club "Why Not" Wawelska 5 street, from 9 p.m. til 6 a.m. But before you came into the party you can take part in and have fun on Zombie Walk where you can dance to "Thriller" with teacher of Jackson Style - Monika Brall. People who don't feel the steps can take part in class with the teacher (cost 35 zl) in dance school "Uanga" in the back of CH Wilenski. E4ME TV (perisian channel): Michael's videos all day. Europa Plus TV (russian channel): "Day of Michael Jackson"
This Deluxe 25th Anniversary Edition includes three CDs, two collectible booklets, and features the first ever authorized DVD release of a concert from the record breaking BAD tour. DVD - Michael Jackson’s legendary July 16, 1988 concert at Wembley Stadium in London. This DVD is not a compilation of performances, but rather one complete show, exactly as Michael performed it for Prince Charles, Princess Diana and the 72,000 fans who were in the audience for that night’s sold out show. The DVD was sourced from Michael Jackson’s personal VHS copy of the performance as shown on the JumboTrons during the concert. This footage was only recently unearthed and is the only known copy of the show to exist. The visuals have been restored and the audio quality enhanced so that fans can share in the excitement of that famous night. CD2 - A CD containing previously unreleased material recorded in Michael’s personal studio at Hayvenhurst. This material includes early demo versions of songs from the album as well as demos for songs not included on the final album. All of this material is being released as it was recorded during the BAD sessions. Nothing has been added or changed. In addition, this CD also includes new remixes from internationally renowned DJ/producers. CD3 - A CD showcasing the audio from the sound truck recordings of the July 16th Wembley performance. The first-ever live Michael Jackson CD to be released, this is the only concert from the BAD Tour known to exist on multitracks. 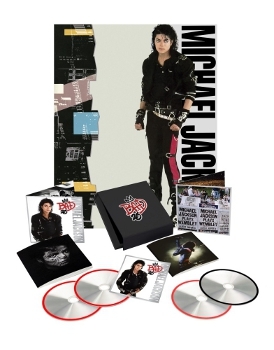 This magnificent 3 CD/1 DVD box also includes two extensive booklets with yet unseen photos from the recording sessions, video sets and the concert tour, the original BAD cover art, a two-sided poster and more. Sony music suffered its second major security breach in a year, with thieves targeting songs and unreleased material by Michael Jackson. It’s alleged they downloaded more than 50,000 music files, worth £160million, in the biggest ever cyber attack on a music company. The news comes just a year after Sony paid £250million for the seven-year rights to the songs following Michael’s death. The contract with Jackson’s estate also allowed them to release 10 new albums, including material from studio sessions produced during the making of some of the star’s biggest albums. In April the details of 77million gamers were stolen after Sony’s Playstation Network was hacked. The breach cost Sony £106million and hugely damaged their reputation. The attack on the Jackson files occurred shortly afterwards but has not been revealed until now. The hack was discovered during routine monitoring of social networking sites, Jackson fan sites and hacking forums. A source close to the company said: ‘Everything Sony purchased from the Michael Jackson estate was compromised. ‘It caused them to check their systems and they found the breach. There was a degree of sophistication. They added that computer experts had traced the hack to the UK by examining a ‘fingerprint’ allegedly left behind. The Serious Organised Crime division took up the case and two men appeared in court last week charged with offences under the computer Misuse Act. Date: February 17, 2012 MJ Estate Sues Dr. Thome. Michael Jackson's estate sued the singer's former manager on Friday, claiming he lined his own pockets by persuading the pop superstar to sign unconscionable contracts in the final year of his life. The lawsuit against Tohme R. Tohme came after more than a year of wrangling between Jackson's estate and the former adviser who has claimed he is owed 15 percent of the more than $310 million collected by the estate since the singer's death. The lawsuit seeks the return of Jackson's property and financial records along with damages and a ruling that Tohme is not entitled to any money from the estate. The contracts involved a refinancing of Jackson's debt related to Neverland Ranch and a producer's fee that Tohme negotiated for himself for Jackson's series of planned comeback concerts in London. "This lawsuit is necessary to finally put a stop to abuse of fiduciary obligations owed to Jackson and seeks to unwind the self-serving and unconscionable agreements (Tohme) encouraged Jackson to enter into” and to compensate the estate for failing to return Jackson's property, the complaint states. Tohme's attorney Paul Malingagio did not immediately return a phone message seeking comment Friday. Tohme served as Jackson's manager from January 2008 until March 2009. Estate attorney Howard Weitzman wrote in a statement that he expects Jackson's former manager to file his own lawsuit to try to gain money from the estate. "We believe the facts will show that Mr. Tohme's claims are meritless and that Mr. Tohme engaged in wrongdoing with respect to Michael Jackson starting early in their relationship,” Weitzman wrote. The lawsuit states that Tohme forced Jackson to pay him a finder's fee for introducing the singer to a group that saved Neverland Ranch from foreclosure. That deal earned Tohme more than $2.4 million and was just one of several deals he was involved in that the estate claims improperly benefited the adviser. Tohme also negotiated a producer's fee of $100,000 a month for the "This Is It” shows planned in London, although Jackson died before the concert series began. The legal action also alleges that Tohme improperly signed away the rights to artwork created by Jackson. Tohme told The Associated Press in July 2009 that he had turned over more than $5 million to Jackson's estate that the singer had stockpiled to purchase a "dream home” in Las Vegas. In September 2010, Tohme sought more than $2.3 million from the estate and claimed he was owed 15 percent of revenue from the film "This Is It,” which used footage from Jackson's final rehearsals. Tohme was credited as Jackson's personal adviser in the film. Date: January 31, 2012 THE IMMORTAL World Tour by Cirque du Soleil now in Europe. While Michael Jackson THE IMMORTAL World Tour by Cirque du Soleil continues to electrify audiences across North America, a first set of highly anticipated European tour dates have now been confirmed for 16 cities! Get priority access to tickets to London, Stockholm and Helsinki today, Jan. 30, to 10 cities across Germany and Austria on Jan. 31, and finally Herning, Copenhagen and Madrid on Feb. 1! Date: January 26, 2012 Michael Jackson has been commemorated at Grauman's Chinese Theatre. Michael Jackson has been commemorated by his three children, Prince, Paris and Blanket who imprint track of Billie Jean glove, footprint and their own hands. In front of the Grauman's Chinese Theatre on sidewalk was placed flagstone with real Jackson's footprint and autograph which Jackson made in 94' in Las Vegas. On this celebration organized by MJ Estate took part Jacksons family, three kids, Katherine, Jackie, Tito, Taj and others. Speach about Michael made, Chris Tucker, Smokey Robinson, Quincy Jones, Justin Biber and others.